Railway Recruitment Board (RRB) has recently published a recruitment notification (Employment Notice No.01/2014) for the recruitment of 26570 various vacancies. Railway Recruitment Board (RRB) applications have been invited for filling up 26570 Assistant Loco Pilot (ALP) and Technician vacancies in Railway Board & Production Units. 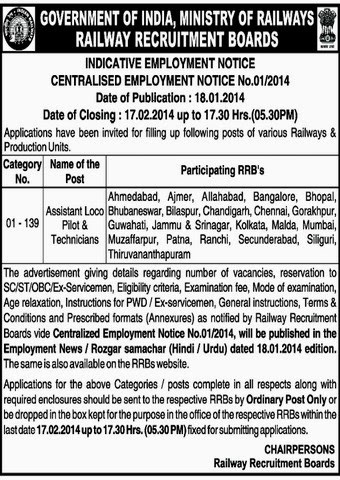 Eligible and interested candidates, who wish to join Railway department may apply through prescribed application format before 17th February 2014. Mentioned below for further details. when group C vacancies will come? Yes, candidates having B. Tech. degree can also apply for technical posts. i m graduate I m currently working as Network administrator/ Computer network Engg ((Experience.. 4 yr) at Pune. so i want to know ….. can i eligible to Technician post. Sir i am diploma computer engineering .am i eligible for ALP. I am diploma instrumentation and control I eligible for ALP?